The Vietnamese have a literal and figurative way of naming food. The “xeo” in banh xeo doesn’t really have a meaning, except that it’s the sound of tumeric rice batter sizzling on the pan. Bo luc lac, describes the shaking of the pan as you saute and sear the beef. 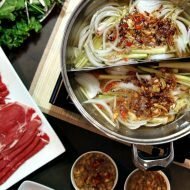 Likewise, bo ne, literally means ducking beef, as in ducking the splatter of butter and oil as the beef is sizzling on a hot pan as it’s brought out to your table. 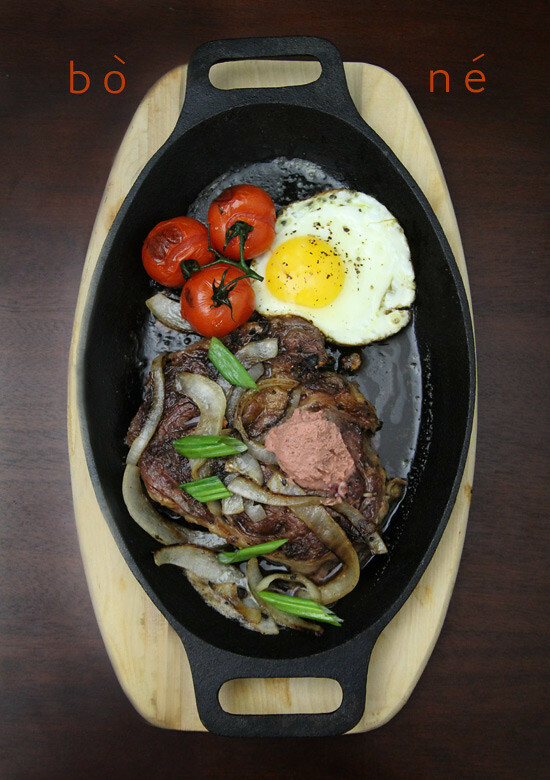 Bo ne is Vietnam’s version of steak and eggs. 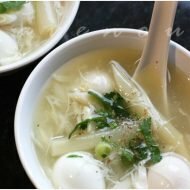 A simple, but quite luxurious dish often eaten for breakfast. Butter is used with a heavy hand, but if that’s not enough to satisfy your greasy spoon, a dollop of pate is often smothered on top of the steak. Spread the pate goodness around, dip the beef in a lime, salt, and pepper sauce and wipe the mixture of butter and runny yolk with crusty french bread and you’re assured of starting the day right. Marinate the steaks with salt, pepper, and rub small on oyster sauce. Heat small amount of oil and caramelized onion until tender and brown as well as tenderize green onions and remove from heat. Pan fry steak with small amount of oil and 1 tbs butter until desired level of doneness. Remove from heat and allow to rest. Using same pan, add remainder of butter and fry the sunny side up egg to desired doneness and also pan fry the cherry tomatoes at the same time. In small dipping bowl, add the salt and pepper and squeeze of lime. 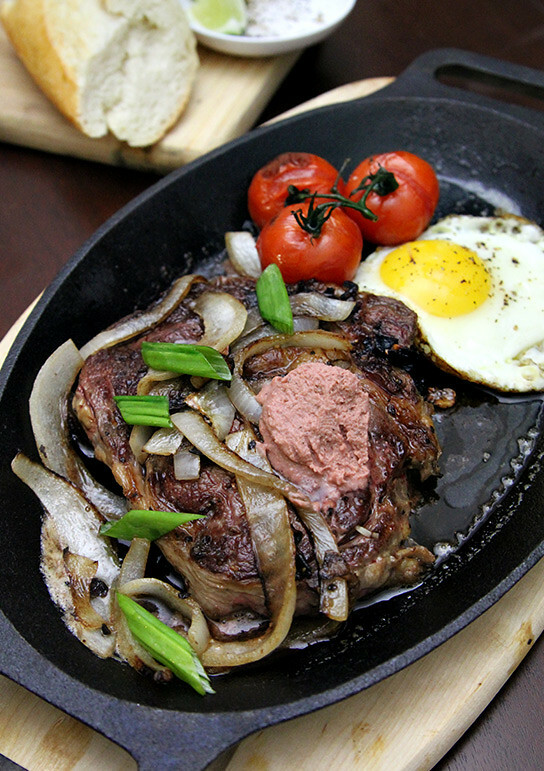 Assemble steak, eggs, and tomatoes on serving platter and finish with dallop of pate and caramelized onions and enjoy. Optional: Use a cast iron pan and serve everything in the pan or heat a seperate fajita skillet like we did on the stove at the same time, and assemble all components together at the end to serve. 1) where can i buy this skillet from? 2) how long should i heat it up for? 3) Should I still cook the different food components in a separate pan before transferring it to the fajitia skillet? 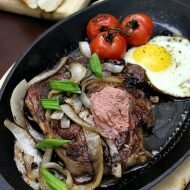 If so, how do i avoid the meat & eggs from over cooking? I look forward to your response. Thanks! We found our skillet at discount stores such as Ross/Marshalls or you can buy online on Amazon. Cast iron retains heat really well, just 5 minutes or so do. Well, think of it as 2 different recipes…eggs and steak seperately. If you want to do it seperate pans that will work too. Just placing it in the heated fajita skillet right before serving shouldn’t over cook it, but just make sure you warn your guest the skillet is hot! Welcome back Hong & Kim! FINALLY, a ‘man’ food posted. I never had this for breakfast, but it sure put things right. I think this will be on the menu next week. I love new meals and this is one to try! 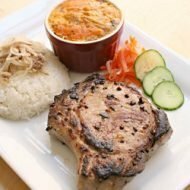 Wow, this looks absolutely delicious! Love all the different flavors going on. Gorgeous photo! I’ve never tried this before but really looks great. Perfect way to start the morning, I bet it’s a tummy filler. Nice photo. Hi! I ate this in Saigon but they served it with hot dogs too, and they used ground beef instead of a steak! :OP I was curious about the origins of this dish, as clearly it is a mish-mash of cultural influences. Of course, the beef haché, baguette are French influences, as well as the paté. And then the addition of the hot dogs (or perhaps tinned sausages) is maybe from the influence of American military men’s food? It was an ‘interesting’ meal to eat, though I can’t say my favorite! hehe Definitely filling. But as I see your recipe, perhaps it would be better how you prepare it with the real steak and grilled onions!